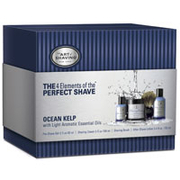 Follow the steps to a perfect shave with The Art of Shaving Mid-Size Kit. Infused with the subtle scent of Lemon, the quartet of luxury shaving products offers gentle formulas and nourishing ingredients to allow the closest, most comfortable shaving routine possible. This gentle aftershave soothes, refreshes and regenerates the skin post shaving. Formulated with Grapeseed Extract, Shea Butter and Vitamin C, the formula moisturizes, rejuvenates and revitalizes to promote healthy skin. Recommended for normal, sensitive and dry skin, the antiseptic and alcohol-free balm helps skin recover from daily shaving stresses while creating a smooth, soft complexion. Pre-Shave Oil: Ricinus Communis (Castor) Seed Oil, Olea Europaea (Olive) Fruit Oil, Santalum Album (Sandalwood) Oil, Lavandula Angustifolia (Lavender) Oil, Eugenia Caryophyllus (Clove) Leaf Oil, Piper Nigrum (Pepper) Seed Oil. Shaving Cream: Water, Stearic Acid, Myristic Acid, Potassium Hydroxide, Coconut Acid, Glycerin, Triethanolamine, Sodium Hydroxide, Methylparaben, Propylparaben. After-Shave Balm: Red Algae Gel, Shea Butter, Laminaria, Jojoba Oil, Macadamia Oil, Glycerin, Cocoyl Glucoside, Cordia Verbenacea, Wheat Amino Acids, Ginkgo Biloba, Centello Asiatica Extract, Nori, Horsetail Extract, Hyaluronic Acid, Glycosaminoglycans, Essential Fatty Acids, Grape Seed Extract, Vitamin E, Acerola (Vitamin C Complex), Amino Acids of L-Lysine & L-Methionine, Essential Oil.